The Nether by Jennifer Hadley is a stark sci-fi thriller which raises questions about man's relationship with technology and the darker impulses of the human psyche. 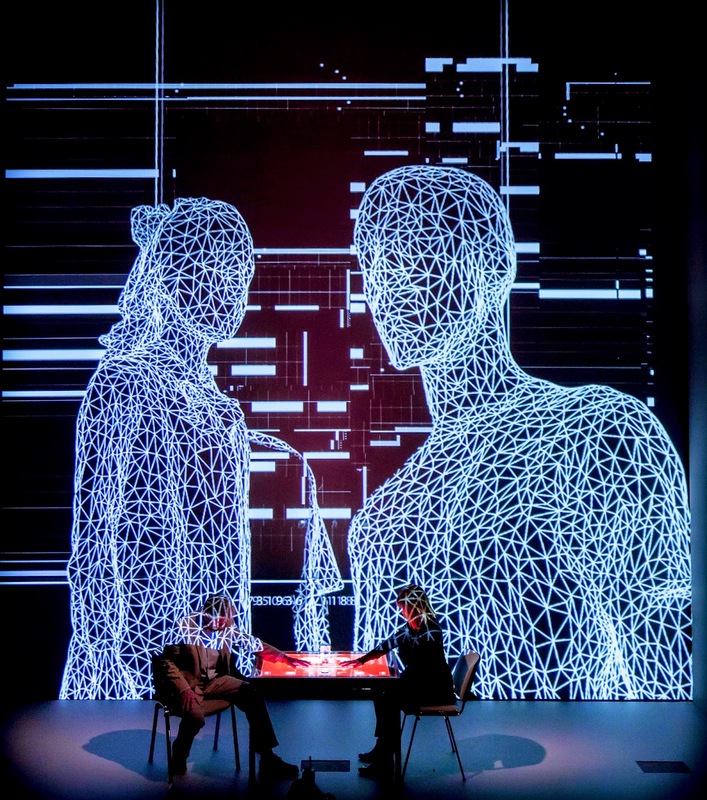 Set in the year 2050, The Nether is the alternate reality that the internet has become, with people finding themselves increasingly retreating from the real world. Jobs, education and the pursuit of fantasies are all available in this new virtual world. Morris (Amanda Hale) is a detective attempting to police the darkest corners of The Nether including a highly encrypted mock Victorian paradise called The Hideaway, created by Sims (Stanley Townsend) as a place where he can fulfill his darkest sexual fantasies, involving violent acts against children. This is weighty subject matter indeed, and one can understand why the play has been billed as controversial. As the interrogation proceeds, the audience is able to see the interactions between characters in The Hideaway, including Nether undercover agent Woodnut's introduction to the world. When the simple stage gave way to effective video visuals and the stunning set construction of The Hideaway, I felt I was seeing something particularly special. Designers Es Devlin and Luke Halls have done a fantastic job of representing this futuristic paradise. However, the high quality of the show's design actually made some of the other elements somewhat disappointing. While the show raises a lot of questions about the nature of digital identity, the question of whether enabling paedophiles to live out their fantasies in a virtual world is morally acceptable, and what might be sacrificed by living a purely digital existence, I felt that it failed to interrogate any of these themes fully. Don't mistake me, this is the sort of show which excites me, both in terms of the writer's willingness to be daring, and the creativity with which it has been produced. The cast is good and I particularly enjoyed Isabella Papas playing Iris (a young talent to be watched). It's just that the multitude of themes left me feeling the play was somewhat watered down. The Nether is a good play and there is much to spark discussion, but it falls short of greatness.